So since beginning this Whole30 journey and just changing the way we think about food, I have become somewhat of a plantain connoisseur. Yes, you may all laugh a lot about this right now thinking about me selecting the perfect plantains at HEB and being really happy about finding nice fresh green ones. But one of our favorite things to do is make plantain chips. Given that it is one of my favorite things to do, I don’t do it a whole lot because it’s kind of a pain. I won’t lie about that. But once I make them, I’m always glad I did. And my munchkins LOVE them so win, win. And hey, grab some of that HEB guacamole if you’re there because it is absolutely delicious with these guys. So is Rachel’s homemade salsa. You’re just going to have to trust me and put out the effort and do this. Just sayin. Ok moving on. Cut off the ends, then cut it in half and slice through the peeling to peel off the outside. Slice the plantain into chips using a mandolin or just a knife. I used to always use a mandolin but then I got tired of cleaning that silly thing and being paranoid that I was going to slice my finger off and just started using my knife. Also, by using my knife they are a little bit thicker and easier to turn over with a fork. Put a huge glob of coconut oil in a skillet. Don’t you love how specific that is? 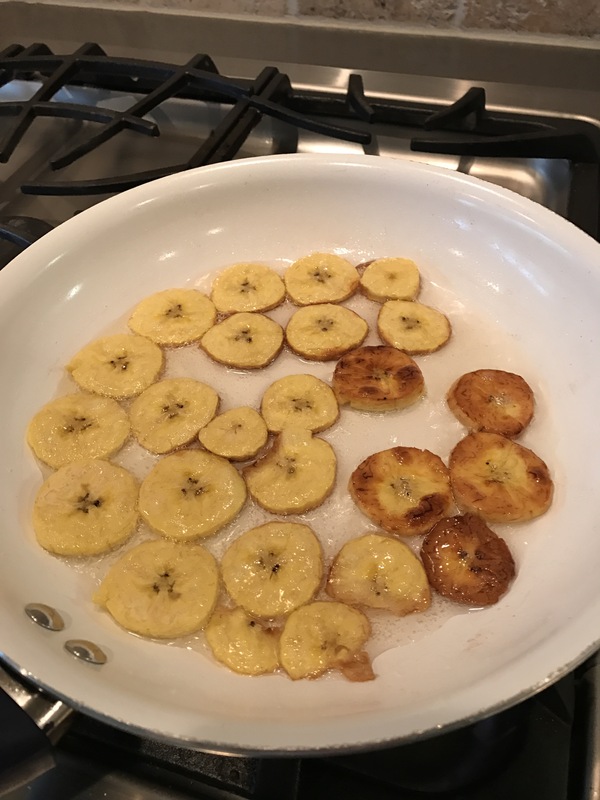 I recently found a ceramic skillet randomly when I was at Home Goods looking for a new one, because good grief we use these things 57 times a day, so thought I’d give it a try and it does really well with plantain chips. Cooks them evenly and quicker than my teflon or stainless steel. Lay your chips in the oil once it has heated, sprinkle with sea salt and let them cook! You may have to add more oil as you go, as you want them to be somewhat covered and they will soak it up as they cook. Don’t walk off, these little guys are like babies, they go crazy if unattended and burn if you look away for a second. Once they start to get golden brown around the edges, use a fork to flip them over to cook the other side. Once they are done cooking, remove them from the oil and lay on a paper towel. I like mine a little crispy so some of them are pretty brown. And I may or may not salt them again on the plate hehe. It cracks me up because Jude knows exactly when I start making these and just runs in and out of the kitchen to get one to eat. At least he is polite and rubs his tummy to say please hehe. Find some tasty salsa or guac and go to town my friends! I always bake my plantain chips so they all cook at once. Haven’t tried them on the stove before but maybe I should! I do love plantains and am always sad when I can’t find them. I’ve had more luck peeling by making 3 slices the length of the plantain and peeling off 3 parts instead of one whole one. These are great tips!! Thank you for sharing! !